Check out the latest edition of Barnes & Noble Tagged. You'll find and interview with the Children's Poet Laureate, Mary Ann Hoberman, highlights of some poetry books (though I wish a title other than Jeff Foxworthy's new book had been selected), and an original poem read by Mary Ann called "A Confession." If you are an author or editor prone to turning your books out in the bookstore, you MUST listen. National Poetry Month Starts TOMORROW! National poetry month begins in just one short day. Here are some of the celebrations you'll find around the blogosphere. Greg K. at GottaBook is celebrating the first annual 30 Poets/30 Days, where every day in April he'll be posting a previously unpublished poem by a different poet!! Sylvia Vardell at Poetry For Children will be reviewing a new children's poetry book every day. Elaine Magliaro will be giving away children's poetry books at Wild Rose Reader and books of light verse at Political Verses in celebration of National Poetry Month. Anastasia Suen at her new Pencil Talk blog will be collecting school poems written by children throughout April and posting one every day. Jone, at Check it Out, will be doing a variety of poetry projects with students in her school, including a “Write a Poem-Send a Postcard” event with her students. Contact Jone if you would like to receive an original poem from one of her students. Here at The Miss Rumphius Effect my Poetry Makers series will feature at least one interview (sometimes two!) with a poet every day during the month. The complete schedule is below. As you can see, there will be much to celebrate. I hope you will join us for all the April festivities. Better Than Free Rice - Check Out Hoongle! I'm always bragging about my students in this space. That's because they're awesome. Well, UR students in general are amazing. Here is the latest venture by some thoughtful UR undergrads. It's called Hoongle. Hoongle is a socially conscious Internet search engine. For every search you do, 20 grains of rice are donated through the UN World Food Program to help end hunger. Here's how it works. When you perform a search using Hoongle, your search is routed through Google. So the results you see are identical to Google’s. The difference is that when your query originates with Hoongle, Google shares a portion of its revenue. This income is donated (less necessary operating costs) to the United Nations World Food Program, which carries out operations around the world to deliver food aid to those in need. Here is a little inspirational math. You can learn more by visiting the Hoongle blog. Together we can make a difference. Go Hoongle! I had the poetry stretches for the month of April all planned out and written, but today's stretch got derailed by life. Not only did I get some very bad news on the home front this weekend, but William's guinea pig finally succumbed to a respiratory infection and died last night. While I thought about my own concerns and consoled a heartbroken little boy, several list poems came to mind. I must follow the muse when it speaks to me, so the challenge this week is to write a list poem. Here are some resources you may find helpful. Paul Janeczko wrote an article for Instructor magazine on writing a list poem. Elaine at Wild Rose Reader shared her list poem recently published in Georgia Heard's book Falling Down the Page: A Book of List Poems. Bruce Lansky has some suggestions for writing list poems with kids. So, that's it. Write a list poem about anything that strikes your fancy. Leave me a note about your poem and I'll post the results here later this week. What does a love letter from a father to a daughter look like? In my case it was conducting science experiments in the basement or silently staring over a game of chess. (Love letters don't have to speak, you know, they just need to be felt.) For Kim Webster Cunningham those love letters came in the form of poetry. Knowing how much she loved animals and reading, her father wrote her a series of animal poems. Kim answered back by turning his poems into a book as a 75th birthday gift. 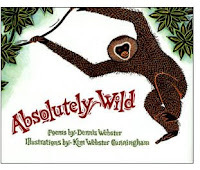 That book is Absolutely Wild, written by Dennis Webster and illustrated by Kim Webster Cunningham. Before I talk about the poems, let me talk about the gorgeous artwork. I'm a sucker for block printing, and the hand-colored linoleum prints in this book are divine. They give the animals such character! The prints are highly detailed and are boldly colored. While most of the illustrations focus on the animals themselves or the animals in their natural habitats, a few are rather fanciful and include elements that reflect the content of the poem. For example, the illustration of the snail shows a house with a white picket fence on the snail's back. It is accompanied by this poem. Whose body seems to run on Jell-o. And never makes the slightest sound. His speed is very, very slow. When you carry your house wherever you go. In addition to the illustrations themselves, interest is added by the red and black decorative borders that enclose most of the poems and illustrations. For a closer look at the artwork you can preview pages at Kim's web site and Google Book Search. The sixteen poems in this book cover species from the ant to giraffe. Written in rhyming couplets or quatrains, they are filled with a bit of science and a whole lot of whimsy. They're fun to read aloud as they bounce along. Here's one of my favorites. To help the local papers. This is a book that readers young and old will enjoy. It's fun, joyful and energetic in both word and illustration. I thoroughly enjoyed this romp through the animal kingdom and know you will too. Recommended with enthusiasm. Source of Book: Review copy received from the illustrator. I've been in a fairy tale kind of mood and so am reading books and poetry appropriate to the topic. Today I'm sharing something terrific from The Poets' Grimm: 20th Century Poems from Grimm's Fairy Tales. Start with the underwear. Sit him down. Hopping on one leg may stir unpleasant memories. If he gets his tights on, even backwards, praise him. Fingers, formerly webbed, struggle over buttons. The round up this week is hosted by the inimitable Julie Larios at The Drift Record. Do stop by and take in all the wonderful poems being shared. Before you go, be sure to check out this week's poetry stretch results. Happy poetry Friday, all! The challenge this week was to write in the form of a triolet. Here are the results. Jane Yolen abandoned this one in the comments. Though three years in the past. But this is the morning after his death. Tiel Aisha Ansari at Knocking From Inside has two poems to share. The first, Savanna Dust, is serious, while the second, Spaetzle Triolet, is goofy (her words, not mine). Tess at Written for Children shared this poem in the comments. Fur-rimmed cups for drinking tea! Kelly Polark left this rockin' poem in the comments. the bass pounds in my chest. My glad heart beats fast. I rock with the best. Julie Larios of The Drift Record also left a poem in the comments. How does a poet look? casing the joint, cold as ice. The answer’s always in the eyes. How does a poet smell? as in How does a poet smell? when, on the surface, nothing shows. a question, when the answer is a rose. Pratibha at Of something 'n' Everything shares a poem entitled Our Marriage. Welcome Pratibha! Jacqueline at The Neverending Story shares two triolets entitled Love is not blind. Winnie the Poohi at Song of my life shares a poem called A Road. Welcome Winnie! Lisa Chellman at under the covers gives us the poem Swing Song. cloudscome at a wrung sponge wrote a birthday poem for her youngest. It's called Birthday Boy. through receding ice and snow. earth’s renewal begins to surge. as the gowns of spring emerge. Do you know what’s at stake? We all know that April is National Poetry Month, but there are other celebrations of books and reading happening in April that you should know about. Here are a few. Okay, I do need to add one poetry event. April 30th is also the second national Poem In Your Pocket Day. Simply select a poem you love and carry it with you to share with co-workers, family, and friends. 1. Books on my desk right now. You are such a goddess! No, it wasn't my husband (*wink*), it was a loyal blog reader commenting on my Poetry Makers project for April. My 8 year-old is a dinosaur lover, so it's no surprise that we also read a boatload of books on reptiles. Jim Arnosky's latest book, Slither and Crawl: Eye to Eye With Reptiles, provides just the right mix of eye candy (LOVE the illustrations!) and information for reptile lovers of all ages. Honestly, the Komodo Dragon on the cover alone was enough to make ME want to jump right in! Let me say right off that I love snakes. I had a pet snake in my classroom and miss him terribly. I also had mice, a hamster, rabbit, turtle, and an aquarium full of fish. The snake was the one creature that always served to terrify and delight. What is it about snakes and other reptiles that we find so fascinating? Arnosky mentions this fascination in his introduction. The book opens this way. Growing up in Pennsylvania, I dreamed of wild places where snakes slithered across jungle trails, lizards climbed on twisted branches of trees, and alligators crawled out of the water onto lush green banks. Reptiles have always captured my imagination in a way no other animals do. Arnosky continues from here to describe the basic features of reptiles and the animals included in this class. He then describes how he observed reptiles in the wild and ends with this note. You can get a close-up view of all the reptiles in this book just by looking at my life-size paintings. So belly down on the ground, eye to reptilian eye, and read all about these fascinating animals that slither and crawl. A turn of the page takes readers to the first animals—snakes. On the left side of the page is a life-like illustration of a banded water snake hanging from a tree. The facing page is actually a fold-out. The outside of the fold shows a number of black and white sketches of snakes, a snake skull (rattlesnake with large fangs! ), snake scales, and snake heads (with a focus on shape). These pictures surround text that provides information about snakes. Here are some of the things I learned about snakes. There are more than 2500 species of snakes in the world. A wide triangular head usually means a snake is venomous. Scales on a snake's back can be smooth or keeled (having a ridge down the center). Scales on the belly, back and head make a snake's body waterproof. The inside fold contains 12 illustrations of a variety of snakes in actual size. Some snakes are simply labeled, while others have a bit of information included. For example, beneath Northern Water Snake is says "Water snakes will bite without warning." The next section of the book is on lizards, and also contains a fold-out with life-sized drawings of 13 different species. What follows is a double-page spread of gigantic lizards, featuring close-up views of the Komodo Dragon and Rhinoceros Iguana (so named for the hornlike bump on its forehead). Next is some general information about reptiles and where they go in winter, followed by a page on turtles, and a double-page spread containing 11 life-size turtle illustrations. My favorite is the very regal-looking Giant Tortoise of the Galapagos Islands. The next two sections both contain fold-outs, the first on sea turtles and the second on crocodiles and alligators. The fold-out for this last section only contains one life-size picture, that of an American Crocodile and her young. The crocodile pictured is "more than 11 feet in length and 3 feet wide at the midsection." The book ends with a section on the richness of reptiles. With over 6000 species, they can be found living in every ocean and on every continent but Antarctica. The final page contains a brief author's note, a list of books for further reading, and a table of metric equivalents for all the measurements mentioned in the text. This is a highly accessible, engaging text that is accompanied by gorgeous illustrations. You should expect to hear plenty of oohs and aahs as the pages are opened and turned. 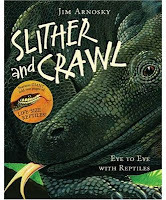 I thoroughly enjoyed this look at reptiles and know young readers will too. I highly recommend it. Source of Book: Review copy received from publisher. This post was written for Nonfiction Monday. This week our host is Pam at MotherReader. Do stop by and see what others are sharing in the world of nonfiction today. I want to try a strict verse form this week. I have never written a triolet, largely because the form scares the heck out of me, but I think it's about time I try. A triolet is an eight line poem with a tightly rhymed structure and repeated lines. Here is the form. You can read an example and learn more about this form at Poets.org. Here is a triolet I particularly like. It comes from the book Fly With Poetry: An ABC of Poetry, written and illustrated by Avis Harley. Another terrific triolet can be found in Paul Janeczko's A Kick in the Head: An Everyday Guide to Poetic Forms. Written by Alice Schertle, the poem is entitled The Cow's Complaint. So, there you have it. Your challenge is to write a triolet. Leave me a note about your poem and I'll post the results here later this week. National Poetry Month - Super Secret Project REVEALED! Last year for national poetry month I wrote a series called Poetry in the Classroom. For 30 days I wrote about a poetry book or related set of books (on a theme) and described how they might be used in the classroom. Over the course of the month I covered 62 books by 39 authors. During the madness of reading nominees for the Cybils, I found my mind wandering to April and thinking about what to do to celebrate poetry this year. After settling on an idea, I plucked up the courage to write to some of the most amazing writers of poetry for children on the planet. I wrote to more than 30 of them, thinking that surely some would be too busy to participate in my project. I'm thrilled to report that 36 of the 38 invited poets agreed to be interviewed regarding their work. I put the same set of questions to each writer, and even though the questions may seem quite prosaic, I assure you their answers are not. You will be moved by their views on writing, their muses, and of course, their poetry. My only dilemma in putting this shindig together comes from an embarrassment of riches. With only 30 days in the month, I've been struggling to figure out how to give each of 36 poets his or her due. Since Poetry Friday is such a big event in the kidlitosphere, I have decided to feature two poets (each with their own post) every Friday during the month. That gives me a total of 34 posts, so there will be two additional days when two poets are featured. So, without further ado, here is the schedule of interviews for April. As you can see, this is a spectacular lineup. There is something here for everyone who loves to read and/or write poetry. This new series, called Poetry Makers, will surely surprise, amuse and inspire you. In addition to big happenings here, other poetry lovers in the kidlitosphere are launching projects as well. Here's a hint of what they'll be offering. Poetry Friday will still be going strong. I'm sure there will be other celebrations. Please send me your plans for April and I'll be happy to add them to this post and the reminder that will go up on the 31st of March. I hope you will join us in celebrating national poetry month. In the book The Place My Words Are Looking For: What Poets Say About and Through Their Work, Paul Janeczko has collected the poems, thoughts, memories, and advice of thirty-nine poets. Since I've been reading a great deal of poetry in anticipation of my super secret poetry project (112 books and counting! ), I've been thinking a lot about the writing of poetry and have been particularly inspired by the words of Gwendolyn Brooks (p. 62). In fact, I like them so much that they are now hanging above my desk. In your poems, talk about what you know. Talk about what you think. Talk about what you feel. Talk about what you wonder. Buy your own dictionary. Read your dictionary every day. CIRCLE exciting words. The more words you know, the better you will be able to express yourself, your thoughts. Be yourself. Do not imitate other poets. You are as important as they are. Do not be afraid to say something NEW. In some of your poems, BE A LITTLE MYSTERIOUS! Surprise yourself and your reader! I won't be sharing my poems for national poetry month, but I will be sharing the poetry of others. LOTS OF IT. I'll also be sharing ... well, you'll have to wait just a little longer to find out. The OFFICIAL announcement regarding my super secret poetry project will be made TOMORROW. I can't wait to tell you what's been brewing and share my excitement over all the great things that will be happening here in April. Come back for the big reveal, won't you? A few months ago while thumbing through the books in my favorite used bookstore, I picked up a copy of Good Poems for Hard Times, selected and introduced by Garrison Keillor. I've been enjoying it tremendously. Reading it is like listening to hours of The Writer's Almanac. I can even hear Keillor's voice in my head while I read them. I would, however, love to hear the author read today's selection, as I imagine it spoken in one long, breathless sentence. The round up is being hosted by Elaine at Wild Rose Reader. Do stop by for a taste of all the wonderful poetry being shared. Before you go, be sure to check out this week's poetry stretch results. Happy poetry Friday, all! Are Children's Books So Black and White? In today's Guardian book blog you'll find a post entitled The eternal allure of good v evil. The subtitle reads "The larger-than-life, black-and-white morality of children's books is a relief for adult readers tired of ambiguity." Children, like dogs, see morality in black and white, their monochrome perspective reflecting the heated simplicity of the playground ("He started it! ", "It's not fair!"). Before they're old enough to concede, sullenly, that life's not fair and start reading the latest contenders for the Booker, young readers immerse themselves enthusiastically in extravagant, epic quests: viscerally satisfying showdowns between good and evil in which you emphatically don't have to see the other fellow's point of view. Williams is writing about epic quest novels here and discusses some of her favorites from childhood. Pullman and Rowling are also mentioned. While I understand what she's trying to say, I find it simplistic to say that children's/young adult literature is so cut and dried. And lacking ambiguity? Please! Yes, there is the theme of good vs. evil, but sometimes it's not easy to tell which team folks are playing for. Fantasy books today are not as black and white as they seem. And as to not seeing the other fellow's point of view? I have a "Trust Snape" t-shirt (thanks Leila!) that says otherwise. The challenge this week was to write a poem using anaphora, or "the repetition of the same word or phrase in several successive clauses." Here are the results. Candace Ryan at Book, Booker, Bookest left this poem in the comments. Kim Kasch at A Writer's Blog also left a poem in the comments. With you, my life was changed. With you my life was rearranged. You looked at me, with a dazzling smile. I looked at you, at the end of the aisle. in my heart that fateful day. Symbolized by a simple bouquet. Time was precious, love was lost. Jacqueline at Neverending story wrote a poem entitled At this moment. Jone at Deo Writer shares a poem about spring. Jone's back, this time wearing her teacher hat, and sharing some poems written by her students. I wrote two poems for the challenge this week. The first is A Soldier's Kid and was one I wrote for the Peace Project Laura Purdie Salas described on her blog. The second is Jim Crow Song, 1954. It's not too late if you still want to play. Leave me a comment about your poem and I'll add it to the list. There haven't been a whole lot of book reviews here lately. I've missed the last two nonfiction Mondays. I have a stack of books for review that stands nearly as tall as my desk. So, what gives? Well, I'm actually holding a huge number of them for April and National Poetry Month. Georgia Heard's book Falling Down the Page: A Book of List Poems arrived today. Page 23 has a poem by our very own Wild Rose Reader, Elaine Magliaro! The book opens vertically and contains delightful poems from cover to cover. I also recently received a copy of Bella & Bean by Rebecca Kai Dotlich, which received a rave review at A Year of Reading and a lovely mention at Laura Purdie Salas' blog. I've been swooning over the photographs taken by Jason Stemple in one of Jane Yolen's newest books, A Mirror to Nature: Poems About Reflection. (Jason is Jane's son, by the way.) The poems are pretty swoon-worthy too! In the car William and I have been listening to a selection of poems from Kenn Nesbitt's soon-to-be released book My Hippo Has the Hiccups: And Other Poems. They are giggle-inducing and there are several that have been played over and over again. I also have an enormous stack of books from interlibrary loan on the couch in my office. (Don't get all excited, it's a really old piece of cargo furniture.) There are close to 70 poetry books from Adoff to Yolen with lots of amazing writers in between. This is my way of saying I'm working really hard on my super secret poetry project for April, so it's stealing a bit of my regular blog time now. There's another reason my blogging has been a bit slow (besides my day job taking up an inordinate amount of time right now). I've been spending my evenings rehearsing for How to Succeed in Business Without Really Trying, the university musical in which I have a small role. We just finished blocking the first act last night. Woohoo! Given the fact that our first performance is April 10, this is a very good thing. I'm tired and sore (lots of singing and dancing), but having LOTS of fun. The cast is largely composed of undergrads and they are terrific. So, that's why the pages are cluttered with poetry these days. It's easy to read and write in the little bits of time I can steal away each day. However, something BIG is coming. I hope you're ready for it, because I know I am! I have been immersed in research related to massive resistance in Virginia. In looking over old photos recently I was amazed by the sheer number and variety of segregation signs. 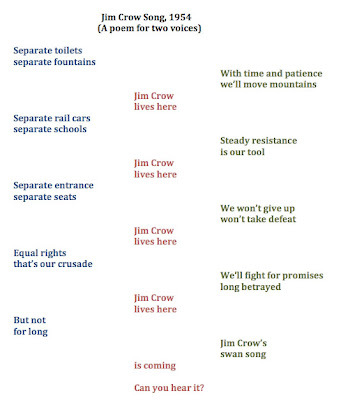 This poem is the result of thinking a good deal about separate but equal and Jim Crow. I've never written a poem in two voices before, but was inspired by Laura Purdie Salas' Peace Project poem. I'm still working my way through several different books on writing poetry and poetic forms. I thought it would be interesting to try writing a poem that uses anaphora. Anaphora is "the repetition of the same word or phrase in several successive clauses." Whitman uses anaphora in the poem Out of the Cradle Endlessly Rocking. Here is an excerpt. You can learn more about anaphora at Poets.org. I wrote a poem yesterday that inspired this stretch. It's called A Soldier's Kid. So, that's your challenge for the week. Write a poem that uses anaphora. Leave me a comment about your work and I'll post the results here later this week. I was up most of last night worrying over a sick guinea pig. (Silly, I know, but I have an 8-year old who will be heartbroken if his new pet dies.) I spent some time grading papers, worked on my super secret poetry project for National Poetry Month, and wrote some poems. I've been working on a series of peace poems ever since Laura Purdie Salas wrote about the Peace Project on her blog. In my sleeplessness last night I wrote this one while trying to dream up the poetry stretch for this week. I now have a poem and a stretch idea. Picture a world that knows nothing but peace. I'm going to keep writing and submit my best poem to the project. The deadline for submitting poems, quotations, or short prose pieces is March 30th, so there's still plenty of time if you want to participate. Super Secret Poetry Project - Update! Guess what's cookin' at The Miss Rumphius Effect for April? One grand celebration for National Poetry Month. RIGHT HERE in 16 days! Mark your calendars and prepare to get your poetry on. OFFICIAL announcement coming on Monday, March 23rd. Poetry Friday Is Here Today! In preparation for National Poetry Month (only 18 days away! ), I am immersed in all kinds of poetry and loving it. Right now I'm reading poetry about poetry. Here's one of my new favorites. As this week's hostess, I'm pleased to offer up links to the following gems. Enjoy this fantastic Friday feast of poetry. Kelly Polark has a contest! Enter to win a copy of Douglas Florian's new book, Dinothesaurus: Prehistoric Poems and Paintings! Greg K. at GottaBook is setting you up for 18 days of longing with a big tease about his national poetry month project. Sylvia Vardell at Poetry for Children has a list of books on magic and luck for Friday the 13th. Sally Murphy at Versing introduces her new blog dedicated to novels in verse. Amanda at A Patchwork of Books reviews the book Food Hates You Too by Robert Weinstock. Sara Lewis Holmes at Read*Write*Believe shares her thoughts on The Free Verse Project at Poets.org. Anastasia Suen at Picture Book of the Day shares ideas for using the book Tadpole Rex by Kurt Cyrus. Martha Calderaro shares her thoughts on Maria Testa's book Becoming Joe DiMaggio. Becky of Becky's Book Reviews has a review of Tropical Secrets by Margarita Engle. Renee at Shen's Books shares a review of Linda Sue Park's Tap Dancing on the Roof. Tasha at Kids Lit has a review of the book Rhymes Around the World by Kay Chorao. Web at Blog from the Windowsill shares a review of Three Little Kittens and Other Favorite Nursery Rhymes, selected and illustrated by Tony Ross. This week's poetry stretch results showcase poems in which two words opposite in meaning were used in both the body of the poem and the title. At Blue Rose Girls, Elaine shares her poem And Who Will Lead the GOP?, along with a link to her new blog Political Verses. Go Elaine! Julie Larios at The Drift Record has a brief poem on the letter P, as well as a fun list of things she loves that begin with the letter p.
Jim Danielson at Haunts of a Children's Writer gives us a poem on Robins. Laura Purdie Salas shares the poem she has written for the Peace Project, entitled Unexpected Links (a poem for two voices). Using a photo of a tree and it's "secret door" for inspiration, Laura Purdie Salas shares the the poems folks submitted for this week's 15 words or less challenge. Linda at Write Time shares three original tanka. Liz Garton Scanlon at Liz in Ink gives us her poem Details of Devotion. Jone at Check It Out shares two student poems and a quote. Laurie Ann Grover at On Point shares an original poem entitled Samurai Armor. cloudscome at a wrung sponge has some lovely photos accompained by haiku. Tiel Aisha Ansari at Knocking From Inside shares an original free verse entitled Buddha Hand. Christine shares two poems written by her daughter. You can find Beauty and the Beast at The Simple and the Ordinary and Home Is at Simply Put. Lisa Chellman at under the covers share her opposites poem entitled Blind/Sighted. John Mutford at The Book Mine Set shares the poem Goblin Market by Christina Rosetti. Susan at Black-Eyed Susan's has the poem Tahar Ben Jellou, translated by Nadia Benabid. Elaine at Wild Rose Reader shares the poem Litany by Billy Collins. You'll also find a video of him reciting the poem here. Mary Lee at A Year of Reading has the poem What I Believe by Michael Blumenthal. Janet at Across the Page shares the poem Sheepdog Trials in Hyde Park by C. Day Lewis. Carol at Carol's Corner gives us Kay Ryan's poem Bad Day. Diane at The Write Sisters shares an anonymous poem entitled As to the Weather. Jet at The Incredible Thinking Woman has John Gillespie Magee, Jr.'s poem High Flight. Love2Learn Mom at Studeo shares the Gary Soto poem Teaching English From an Old Composition Book. Kelly Fineman at Writing and Ruminating has a Jane Austen poem entitled Venta. Valerie at Living the Good Life on Not Enough Acres Farm shares a couple of limericks, including one by Edward Lear. Kim Cassidy at Whimsy House gives us the Jane Yolen poem The Cardinal. Yat-Yee Chong shares The Meaning of Life by Nancy Fitzgerald. Over at Bildungsroman Little Willow shares the poem She Ran by Amy Studt. Charlotte at Charlotte's Library has the poem Guest by Rabindranath Tagore. Amy at ayuddha.net shares some A.A. Milne and Now We are Six in honor of her daughter's birthday. Jacqueline at Neverending story has a great picture and The Flying Squirrel by John Gardner. Karen Edmisten shares James Agee's Knoxville, Summer 1915. Jennie at Biblio File gives us Mercutio's Queen Mab speech from Romeo and Juliet. Jill Corcoran shares her love for Valerie Worth along with two poems, safety pin and dinosaurs. Suzanne at Adventures in Daily Living shares some Dickinson and the poem The Grass Has So Little to Do. Justina at Wordlings by Justina gives us Scarlet by S.Y. Headley. Jama at Jama Rattigan's Alphabet Soup shares thoughts on the recent birthday of James Taylor, along with some fine lyrics. Shelf Elf has the video Poetry with Cookie Monster. Marjorie at the Paper Tigers blog shares links to the BBC's Poetry Pie programme in which poems by Debjani Chatterjee are featured. Over at readertotz you can see Shel Silverstein reading Crocodile's Toothache. In celebration of Holi, the Hindu festival of colors, Nandini Bajpai at Notes from New England shares the Beatles' song Here Comes the Sun. 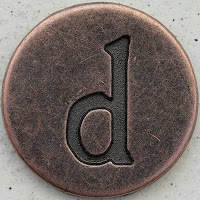 How Do I Love Thee Letter D? Julie Larios of The Drift Record participated in a challenge where she was assigned a random letter (lucky duck got the letter P) and then had to make a list of things she loved that began with that letter. Because I'm in major procrastination mode, I asked her to send me a letter. Here's my list for the letter D.
This photo comes from Leo Reynolds' photostream. Dickinson, Emily - Probably my favorite female poet, I can't get enough of her work. I read Dickinson voraciously each fall when her words just seem to fit my favorite of seasons. Here's what she had to say about poetry. If I read a book and it makes my whole body so cold no fire can ever warm me, I know that is poetry. If I feel physically as if the top of my head were taken off, I know that is poetry. These are the only ways I know it. Is there any other way? Downward Facing Dog - I have a love/hate relationship with yoga. At the beginning of class the instructor reminds us that we must let go of judgment and competition. As a former gymnast (for nearly 20 years), where it was all about striving for perfection, I find these are mighty hard to let go of. Even though this mindset has been hard to adopt, I do love how I feel during and after yoga. I still like being upside down and enjoy the rush of blood to my head and the stretch I get from this pose. Doughnuts - Growing up in the north we had no Krispy Kreme. Oh sure we had doughnuts, but not like these. I was initiated when I moved to Richmond. I love going in when the "Hot" sign is lit to watch them being made. Is there anything better than a hot glazed doughnut? Or a chocolate iced cream filled? Or a raspberry jelly? Or ... oh heck, just give me a box of assorted! Double Dutch - My idea of jump roping as a kid was seeing how many times I could sing Miss Mary Mack all the way through before getting tired or tripping. I don't recall jumping rope while others turned more than once or twice. That's probably why I watch kids double dutch today and am amazed at their athleticism, coordination and synchronization. Darjeeling - I am a tea drinker. My favorite black tea is Darjeeling. I like it good and strong with lots of milk and just a bit of sugar. Daisies - These flowers always make me smile. 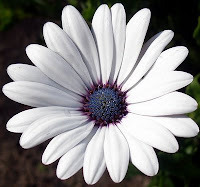 As Kathleen Kelly said in You've Got Mail, "Don't you think daisies are the friendliest flower?" I know I do! Mr. Darcy - Yes, I'm an Austen addict. I love Darcy, but I'm also fond of Captain Wentworth, Edward Ferrars and Mr. Knightley. The point here is not Darcy but Austen, so I cheated a bit on this one. Degas, Edgar - It wasn't the myriad of ballerinas that made me fall in love with Degas, but rather the piece Woman Ironing. It reminded me of my mother, who spent hours pressing our clothes and ironing linens. I still see her when I see this painting. 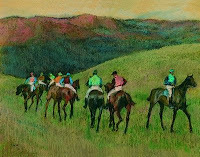 I'm also quite fond of his horse paintings. Dogs - No matter the shape, size, gender or breed, I am a dog lover. I'll even take the slobbery ones. My first dog was an Irish Setter named Tricia's Garnet, or Trig for short. Today I own a doberman/terrier mix that we rescued from the pound. She's 11 and a half and still acting like a pup. Well, that's my quick stab at this. If you want to play, leave me a note and I'll send you a random letter. The challenge this week was to write a poem in which two words opposite in meaning were used in both the body of the poem and the title. Here are the results. Jane Yolen left this poem in the comments. as news, but it is not. Kim Kasch also left a poem in the comments. Jacqueline at Neverending story shares a poem entitled Clean vs. Green. Lisa Chellman at under the covers gives us the poem Blind/Sighted. I tried hard to write a funny poem, but my poems and I are sailing through the doldrums right now. At any rate, here's my contribution. What does this have to do with Mrs Murphy’s daughter? Four days. I've been gone four days and the world around me has changed. The pear trees and forsythia bushes are blooming, the geese and ducks at the lake seem to have magically tripled in number, and the birds have returned en masse to the back yard. I love spring nearly as much as fall. I did a bit of reading while I was away and must share. Here are the first lines of each book I finished and a favorite excerpt. First Line: A boy with a parrot on his shoulder was walking along the railway tracks. Excerpt: He felt a mounting sense as they headed down toward Bethnal Green Road—a sense that had obscure roots in that vanished market morning when he had passed amid the hectic stalls of the dealers in animals—they were penetrating to the heart of some authentic mystery of London, or perhaps life itself: that at last, in the company of this singular old gentleman whose command of mystery had at one time been spoken of as far away as Kerala, he might discover some elucidation of the heartbreaking clockwork of the world. First Line: In an unremarkable room, in a nondescript building, a man sat working on very non-descript theories. Excerpt: "I'm Margarita Staples." She bowed in her harness. "Extreme librarian. Bookaneer." **Sidebar** - Bookaneer?! Now THERE'S a blog name if I ever heard one! I hope someone snaps it up toot sweet. First Line: Dear Poet, How can I become a better writer? Finally, the Share a Story, Shape a Future blog tour for literacy continues today with a focus on visiting libraries. Here is the schedule. I was traveling yesterday and failed to link to day three activities. In case you missed it, yesterday's topic was reading aloud. Today is day 2 of the Share a Story, Shape a Future event. The topic for the day is selecting reading material and the host is Sarah Mulhern at The Reading Zone. There are many wonderful ideas being shared, so please take some time to check out today's posts. I've been reading Richard Wilbur lately, but that's not exactly the opposite I was thinking of. In The Practice of Poetry: Writing Exercises From Poets Who Teach, Stuart Dischell writes about The Attraction of Titles. (1) Choose a pair of words with opposite or nearly opposite meanings. Primary choices such as "hot and cold" or "good and evil" might be avoided, although sometimes the obvious can be a good place to begin. Try instead to find a more suggestive or playful pairing such as "calm and calamity." (2) Write a poem titled and based upon the word you have chosen. So, that's it. Your challenge is to write a poem that uses opposites in poem and title. Leave me a comment about your piece and I'll post the results here later this week. Reading isn't just a skill, it's a habit, and one that begins at home. But time for reading isn't always a priority, and even when it is, many families have difficulty squeezing it in. Here are a few simple ideas for encouraging the reading habit at home. Children can't read if they don't know the alphabet. Once they recognize letters, they can be put together to form words. Never underestimate the power of playing with letters as a means to begin developing reading skills. Here are a few ways to have fun with letters and sneak in some reading at the same time. Bathtub Fun - One of our favorite "pre-reading" activities was playing with foam letters in the bathtub. William would line them up from A to Z and then hide his eyes. I would remove a letter and he would try to guess which one was missing. Sometimes instead of removing a letter I would rearrange them. As he got older, we would spell words for each other and then read them. Letter Art - Kids love to make art using all kinds of media. I invested in alphabet rubber stamps so that William's art could be adorned with letters and words. In the beginning, the artwork contained his just his name stamped on the page. Then, the objects in the scenes were labeled. Now, the art is fully described or sometimes forms the pages of a story. Tell Stories - Listening and speaking are important tools for developing literacy skills. Children are born storytellers. Sometimes all it takes is a prompt or open-ended sentence to get the ball rolling. While preparing dinner my son sits at the kitchen counter and we tell stories in tandem. I usually begin with "Once upon a time there was a boy named William who ..." William then chimes in with the next sentence. Then it's my turn. If he doesn't like my sentence, he often offers to "fix it" for me. We continue this way until the story is finished. This is a great activity that is portable. We do this in the car, while waiting for appointments and other times when we need to fill gaps in our day. Write Stories - When you find a book or character your child loves, try to imagine together what the next adventure might be. William was very fond of Henry and Mudge and Mr Putter and Tabby books for quite a while. Every so often he'd speculate on the kind of story he would like to see. I made him several blank books and wrote the title Mr Putter and Tabby __. William filled in the blank and then set off writing and illustrating his own story. We have many of these homemade books that became part of our regular reading routine. For a young child, there is often nothing better or more than reading your own words on the page. When you have a child who begins to equate reading with homework and school, how do you make reading time at home fun and appealing? Here are a few ideas. Cook Something Up - We need to recognize that today reading occurs in many different forms and media. We read maps, music, recipes, signs, notes, letters and more. When I can’t commit to a novel I read poetry and cookbooks. Since William loves to help out in the kitchen, particularly when I’m baking, he is my official "recipe reader." In addition to telling me what ingredients I need and how much, he delights in reading the introductions and notes about what we’re cooking. Sign Poetry - Travel is actually a very good time to practice reading skills. We keep a pen and paper in the car and often play a game where we collect words and phrases for poetry. We read and write (not me silly, I’m driving!) words we find on signs, billboards, bumper stickers, license plates, etc. Once we have a decent list, we make up silly poems using the words. Lately the words Ben Franklin, fresh, gas (yes, he’s 8–enough said), stop and target keep reappearing in our poems. To keep them new we try to find rhyming words to flesh out the poem, and when we can’t think of words, we make up our own! Never Leave Home Without It - No, I'm not talking about a credit card, I'm talking about a book. When I was growing up my father never left the house without a book. These days, neither do we. Anytime we leave the house for errands we carry a bag that holds plain paper, crayons or colored pencils, and a few books that William has selected. Now the mantra before heading out is "Go to the bathroom and then grab a book." There always seems to be time to read in the car, the doctor's office, the restaurant, you name it. Develop this habit now and it will last a lifetime. William packs books in his backpack every morning so he has something to read while waiting for the afternoon bus. Check It Out! - Get your child a library card. When William turned five I promised him he could have his very own library card. On his birthday we went to the public library, filled out the paperwork, and he signed his name. This is a big responsibility and one that he takes very seriously. He has his own book bag for transporting books to and from the library. He loves to use the automated systems to return and check out books. Since our library has such a great web site, we can go online to look at his reading history and even get neat little printouts of the books each week. Use That Card - Once your child has a library card, you need to use it. I know that this isn't always easy, but if you can make time for piano lessons, swim team and the myriad of other outside commitments your children have, you can make time to visit the library one day a week. William and I go every Friday when he gets home from school. The key here is to pick a date and make it happen at the same time each week. Your child will not only have something to look forward to, but also have a deadline for finishing some of those books. While you're there, check out some books for yourself. Modeling the importance of reading in your own life will send a powerful message. Hey, What's This? - My son is at that age where he generally turns his nose up at most books I recommend directly. However, I am smarter than the average bear. Now when we go to the library I check out books I think he'll like. When he asks about them, I simply say they're MY books. When we get home from the library our routine is to look over our books. I make a big deal out of looking at mine. Then I leave the ones meant for him on the counter or at the table where he sits. Works. Every. Time. Can You Hear Me? - I have an iPod dock on my kitchen counter. While I generally listen to NPR while cooking meals, I listen to audiobooks while cleaning up and baking. William is generally with me in the kitchen when the good stuff is cooking, so we listen to stories together. At first we started listening to audio for which we had the companion book. Now we listen to all kinds of pieces. The best part about audio stories is that they too are portable, making for a great listen in the car. They also fill a nice gap in the evening when we need some quiet time. Now William often lets a story lull him to sleep instead of music. Light Up the Night - Buy your child a flashlight or book light and let him/her read under the covers. William will actually go to bed early if I tell him he can have time reading AFTER lights out. Reading undercover is fun and helps build independence. Expand Your Horizons - Sometimes I think reading should be like the buffet at my favorite organic grocery store–there’s a whole lot of variety and one day I hope to taste it all. We need to encourage kids to try more than the same old stuff on the menu. Don't get me wrong, as I love picture books as much as the next person, but only reading from the same genre or format can get pretty old. Introduce your kids to nonfiction, poetry, folktales, biography, comic books, graphic novels, and anything else you think they might like. Eventually you will connect with the right stuff, even for the most reluctant of readers. The most important and obvious piece of advice I can give you is to read TO your child every day, no matter how old he/she is. Make time to do it, make it routine, and make it mandatory. It should be the one thing that isn't missed, no matter what. Even though William and I frequently read throughout the day, the one time we do not miss reading together is at bedtime. We curl up together under the covers, read the books he selects, talk about them, and then talk about the day that is ending and our plans for the next one. One more thing–Make sure your child has books of his/her own. While libraries are a wonderful resource, there is simply no replacement for owning your own books. Every child should have this opportunity. William and I spend a lot of time at consignment shops and yard sales looking for used books. We also buy online and in the bargain book section. I send book lists to relatives looking for ideas for birthdays and holidays. The gift of a book is one that will keep on giving, so make sure books get their due right along with the toys and games that are so popular. Today's subject on Raising Readers is being hosted by Terry Doherty at Scrub-a-Dub-Tub, the Reading Tub blog. You can find other entries on this topic at the following sites. Tomorrow's posts will focus on selecting reading material. Day 3 is dedicated to read aloud. Day 4 looks at visiting libraries. Day 5 is all about the future of reading and the role of technology. Be sure to check out the entire schedule for the week at the Share a Story - Shape a Future blog.